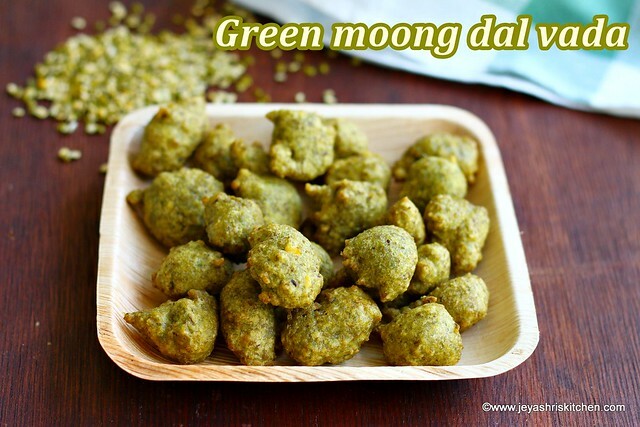 Green moong dal vada recipe, using split green moong dal, crispy no onion no garlic recipe, perfect snack during navaratri days. Few months back when i called my friends for Varalakshmi pooja, this green moong dal vada is a part of the menu. I have already posted moong dal bhajiya | pakora but that recipe includes potato and onion. This split green moong vada was a super hit and i served it with coconut chutney. Do try this during this festival season and let me know how it turned out. 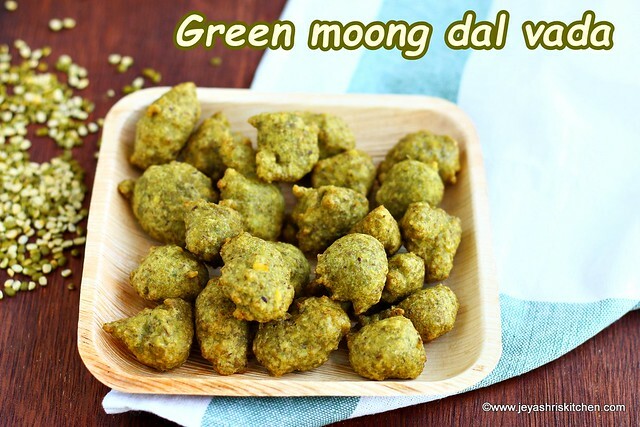 Description: Green moong dal vada recipe, using split green moong dal, crispy no onion no garlic recipe, perfect snack during navaratri days. Wash and soak the split green moong dal in water for 3-4 hours. Even over night soaking is fine. Drain the water completely and grind this along with green chili, ginger and mint leaves. Grind into a paste. If slightly here and there it is coarse it is fine. If the batter is too runny add 1 tblsp rice flour. Do not add more than that. If making in bulk add salt in batches. Take a small portion of the batter with your hands and deep them in oil. Alternatively, you can spoon in the batter to the oil. Once done, take out from oil and drain the excess oil in kitchen towel. Repeat this for the remaining batter. This stays more crisp when it is made as mini vadas. Do not add more rice flour than mentioned. You can add finely chopped cabbage to the vada batter. 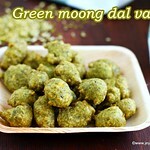 Instead of split green moong dal you can use yellow moong dal to make the vada. Grind this along with green chili, ginger and mint leaves. Ensure that the batter should not be thick like our urad dal vada batter. Adding mashed boiled potato to the moong dal vada gives a nice taste to it.